Invest in yourself. Kickstart Your Year. What is Kickstart Your Year? Kickstart Your Year is a 12-week coaching intensive featuring weekly 1:1 personal leadership coaching sessions and self-guided exercises built upon models of adult learning and sustainable transformation. It is designed to support individuals pursuing career-related or personal goals with accountability, positive habit-formation, organization, self-discovery, creative thinking, planning and execution. Curious about what topics our clients most commonly choose to focus on? Check them out on our FAQ page. Because waiting isn’t an option when it comes to pursuing your dreams and going after your goals. We can spend an entire lifetime waiting for the perfect moment, when really, the “right” time is right now. Following your aspirations, whether personal or professional, requires grit, courage, motivation and commitment. I believe that you are intelligent and capable of working through whatever challenges stand between you and the manifestation of your vision. I also believe that wholehearted support is often a piece of the solution. That’s where Kickstart Your Year comes in. How does Kickstart Your Year work? Kickstart Your Year is a whole lot of you getting to know Y-O-U. 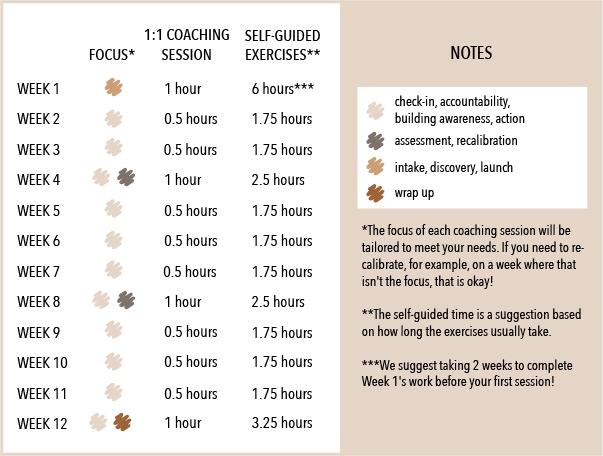 Each week, you’ll receive a series of self-reflection and planning exercises and prompts to respond to, followed by a one-on-one coaching session with EHM | Coaching’s founder, ICF-certified leadership coach Emily Mitnick. Weekly coaching meetings are 30 or 50 minutes depending on the week and occur over Zoom video conferencing. The weekly exercises are designed to help you internalize your learning and build a consistent practice of self-reflection, which is necessary to achieve lasting success and fulfillment. For more information about what coaching with EHM | Coaching could look like for you, head over here.